Could Apple's HomePod Drive Future Smart Home Adoption? Growth for the smart home market continues to be driven by take-up of energy management and security solutions, as consumers seek cloud-powered answers to practical problems at home. When asked about their most preferred manufacturer of smart home tech, Amazon and Apple take the prize—neither of which make thermostats or security cameras. ChangeWave's recent survey of 3,965 primarily North American respondents focused on overall smart home trends and smart speakers, including purchase intent for the Apple HomePod. In the latest survey, 31% of all respondents say they use smart home tech. Importantly, 37% of smart homeowners have three or more devices—five points higher since April. Smart thermostats (12%) are the most widely adopted device, followed by security cameras (9%), motion sensors (9%), and smart speakers (8%). The smart speaker market continues to show momentum, with several new entrants ready to launch later this year, including Apple's HomePod and devices from Sonos, Sony, and Panasonic. A solid 10% of respondents say they are likely to purchase the upcoming HomePod, Apple's new smart speaker. When we compare this with Apple's last major category introduction, the Apple Watch, the prerelease results for the HomePod are not as high. At the time (September 2014), a total of 15% said they were likely to buy the Apple Watch. Importantly, the difference may lie in the don't know category since more respondents aren't sure if they'll buy the HomePod compared with when we asked about the Apple Watch. There was a great deal of hype leading up to the Apple Watch release, seemingly more so than for the HomePod; lack of awareness is likely a key factor. A total of 28% of interested consumers plan on buying the HomePod within three months of release. 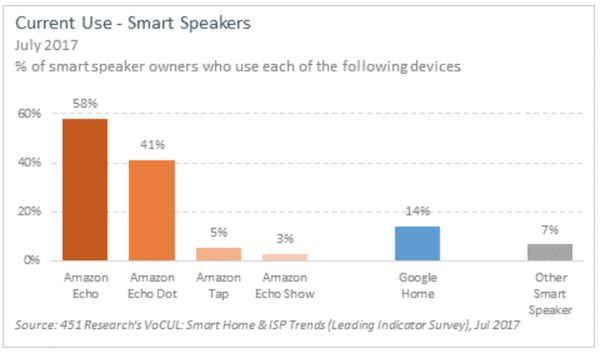 Amazon Echo (58%) and Echo Dot (41%) lead among respondents who own a smart speaker. Amazon Echo leads the category in overall satisfaction, with 46% saying they're very satisfied. But Google Home retains the advantage in AI response accuracy. Three in 10 Google Homeowners (30%) say they're very satisfied with the accuracy of Google Assistant's response, compared with 23% of Echo and 24% of Echo Dot owners who say the same about Alexa. A total of 31% of respondents say they plan on buying at least one specific type of smart home device in the future. Another 14% are unsure if they will purchase any smart home tech, and 55% do not plan on buying. 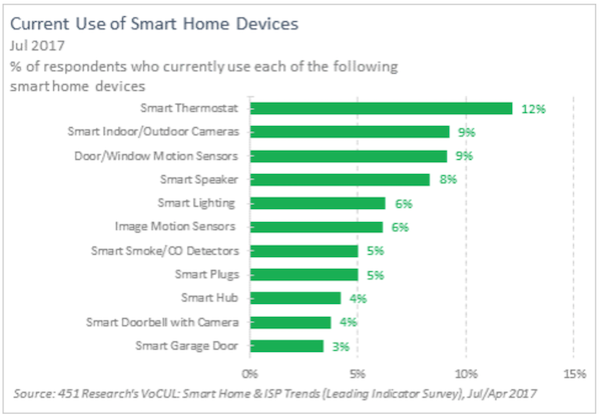 Smart cameras (12%) and thermostats (11%) show the biggest upside. 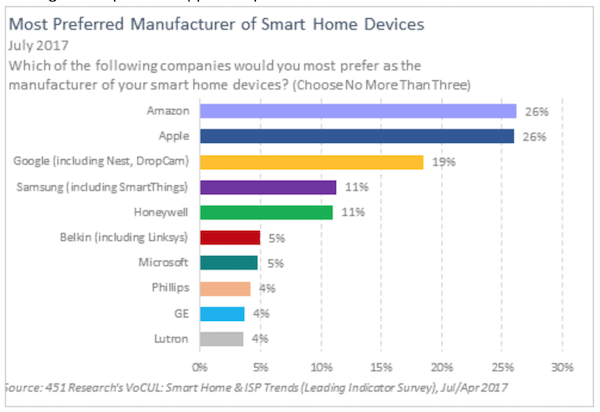 Amazon (26%) and Apple (26%) are locked in a battle for the top spot in smart home brand preference. Amazon continues to add new devices to its Echo family while updating capabilities to its existing smart speakers. Apple is expected to release its HomePod in December.